New technologies are now available that allow screening for a large number of conditions through a single process. 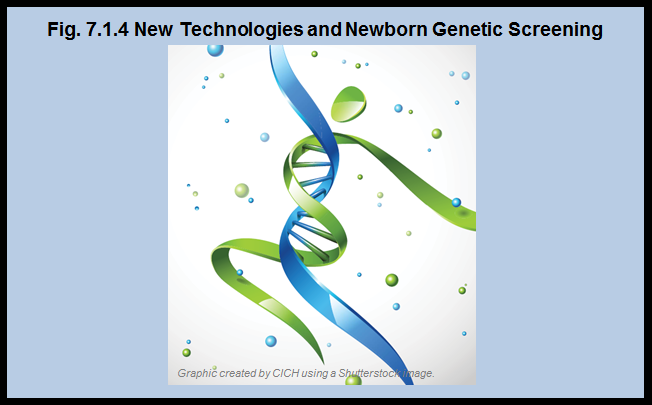 One technology that is moving into the clinic to help with diagnosis and treatment is whole genome sequencing (WGS).1,2 Of note, however, the level and use of new technologies varies from site to site and between jurisdictions. It is not readily available everywhere, therefore it is not accessible to all children and families. 1Green RC, Berg JS, Grody WW, Kalia SS, Korf BR, Martin CL, et al. ACMG Recommendations for Reporting of Incidental Findings in Clinical Exome and Genome Sequencing. American College of Medical Genetics and Genomics; 2013. http://www.acmg.net.